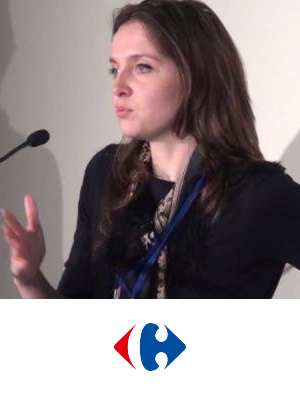 With an Energy Engineering degree from the Ecole des Mines de Douai, Camille started her career in a start-up specialising in energy efficiency and in the EEC in Paris. She quickly evolved to coordinate the Sustainable Development Committee and to participate in the launch of its UK subsidiary. With her technical knowledge and international background, plus the necessary dynamism and adaptability, Camille now works as Group Energy Manager at Carrefour. Her role includes ensuring synergy between different energy players in the different countries of the Group (France, Belgium, Italy, Spain, Poland, Romania, Brazil, Argentina, China, Taiwan, …). She also tracks the technology monitoring and evaluation of renewable energy and new technologies to reduce energy consumption and carbon emissions of the Group. Consequently, Camille is constantly looking for innovative solutions to improve the environmental impact of the Group. She then evaluates the adaptability of these technologies in their technical and commercial functions to make the best decisions. Examining Consumption Profiles And Best Solutions For Supermarkets – To What Extent Is Energy Storage Needed?